Rhydian Tolcher-James started training in Karate at the young age of 4 years. He trained for two years before being entered into the European Karate Championships in Holland in 1992. He amazed everyone and took the championship beating a German opponent into 2nd place. The Vale of Glamorgan were waiting to congratulate him on his return holding the European Cup, the Youngest ever to achieve that level of martial arts. 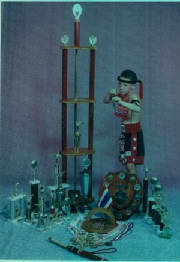 At the age of 7 he achieved his first Black Belt (Red Mongkon in Muay Thai). 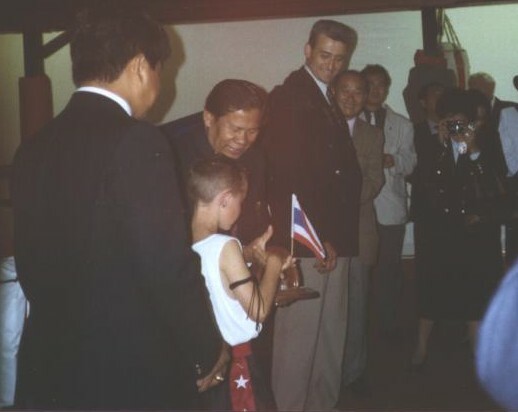 The former Deputy Prime Minister of Thailand came across to honour his Grade and to present him with a plaque for his dedication and achievement That of "Youngest Member of the Palace Guard" in Thailand. The event was published in Combat Magazine January 1996. Also at the age of 7 he attained his first Black Belt in Freestyle Karate. Rhydian trained everynight proving his dedication to martial arts. He trained firstly in Karate and went onto his Thai-Boxing Class almost everynight of the week. This young boy was a very dedicated martial artist. Rhydian achieved his 1st Degree Black Belt in Tae-Kwondo at the age of 9 years. In 1994 he won the Grand Championship for the World United Martial Arts, and the Grand Champion of the Welsh Contact Karate Association, plus many other achievement along the way including European Martial Arts Champion. He achieved World Kickboxing Champion in 1996, 1997, and 1998, after which he decided to concentrate on football, where his ability has been noticed, and represents a number of different football clubs. Receiving his Award "Warrior Status"
He is now a 3rd Degree Black Belt in both Karate and Kickboxing. and 1st Degree Black Belt in Thai Boxingand Tae-Kwondo. Also a an Instructor within the Welsh Academy of Martial Arts. Owing to his dedication and outstanding achievements since he has trained in martial arts, an author by the name of David Mitchell heard of him, and approached him to appear in a book entitled "Young Martial Art Enthusiast". This was such an honour for Rhydian and Lynne his mother. Lynne was asked to provide two students to accompany Rhydian during the photoshoot which was held in Convent Garden, London. One of which appears right on the front of the book in the Black and Red Uniform. Rhydian appears both in the inside page and under the chapter Thaiboxing and Freestyle. He is now known throughout many parts of the World, as an Ambassador of Martial Arts. He won Sports Personality of the Year Award in 1995 for his outstanding achievements. This young man is a credit to his chosen sport, and encourages youngsters to follow in his footsteps. Although he doesn`t take part in martial art tournaments at the moment he is a dedicated footballer, and member of a professional club, his love is still martial arts. Hopefully one day he will return the the fighting scene.